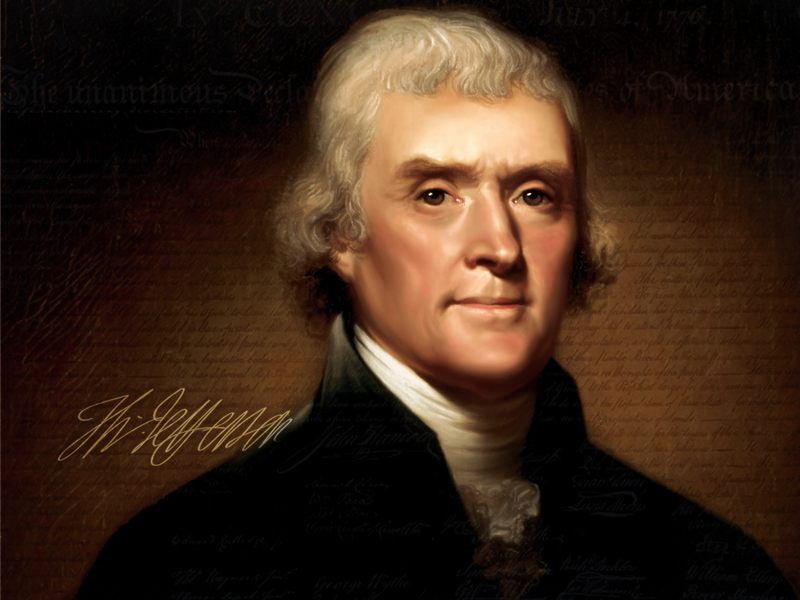 Why did a Pious Baptist Preacher Give Thomas Jefferson a Mammoth Cheese? From all accounts the cheese was “favorably received.” One account recalls that the cheese was carved “in the presence of the president and cabinet, foreign diplomats and many distinguished men and women of ancient note…and that it was the object of great curiosity.” Leland received special thanks and was “introduced person, by person by the president, to the entire gathering.” The celebration for Leland did not end with the ceremony; he celebrated all the way home in what “resembled a triumphant march.” (1) This little known event is a reminder of the great alliance between rationalists such as Jefferson, and the pious dissenters who helped establish religious liberty in the new nation. But in light of the extremely vitriolic election, Leland added, “but, sirs, expect to see religious bigots, like cashiered officers, and displaced statesmen, growl and gnaw their galling bands, and , like a yelping mastiff, bark at the moon, whose rising they cannot prevent. (2) Leland was a devoted Jeffersonian Republican, and aggressively campaigned for Jefferson in his bitter presidential contest against the Federalist John Adams. But this was not the first time they fought for the same cause. In Virginia, Leland fought doggedly along with Jefferson and Madison to disestablish religion; Jefferson and Madison as representatives in the Virginia legislature, and Leland as a respected leader in the dissenting community. The alliance between pious dissenters and rationalists like Jefferson should not come as a surprise since, as explained by Leland, “Bible-Christians and deists have an equal plea against religious tyranny.” (3) However, this was not a mere alliance of convenience for Leland, as his overflowing praise illustrates. Despite their different religious sensibilities he had a deep respect for his allies. When it came to matters of religious liberty and political principles, these men saw eye to eye. Because “accommodationists” are in favor of state accommodation of religion rather than the separation of church and state, and they have sought to prove that the dissenting allies of the rationalists did not want a strict separation of religion and government. Instead, they argue, the dissenters were only seeking to achieve the equality of all religious societies and to limit government interference in church affairs so that they could more effectively infuse society and government with their Gospel message. (5) This interpretation of the dissenting position is questionable in general, but in the case of Leland it is demonstrably untenable. Most accommodationists concede Leland’s separationist credentials and therefore, try to dismiss him as unrepresentative. But these attempts are unconvincing since Leland, as an important Baptist leader in Virginia and Massachusetts, was frequently sent to the legislatures of these two states as well as Connecticut to be their spokesman. (6) If Leland’s views in favor of a strong separation were objectionable, why would the Baptists sent him as their representative? And as a central figure in the fight to disestablish religion in several states (Virginian, Massachusetts, Connecticut, and New Hampshire), and in securing the Bill of Rights via his influence on Madison, Leland’s views on church-state relations deserve to be taken seriously. Recognizing Leland’s importance, the accommodationist Carl H. Esbeck attempts to make him his exemplar dissenter, claiming that he “exemplifies the American church-state proposition in more respects than any other figure during the fifty-nine-year period of disestablishment.” The dissenting profile, as distinguished from the rationalist profile, is described by accommodationists as having the following three main characteristics: 1) they emphasized religion, not rights; 2) they sought equality for religious societies rather than for individuals; and 3) they sought only to limit the government not the church. (7) This profile is compatible with an accommodationist version of church-state relations since it would rule out only those types of government-religion interactions which did not treat all religious groups equally and government interference in religion but not the other way around. Does Leland fit this accommodationist profile? Or is he more in line with the rationalists’ conception of a strict separation of church and state? The main distinction between the dissenters and rationalists was their level of religious piety, and it is this factor that the accommodationists claim accounts for their different conceptions of church-state relations. As described by Esbeck, “they were religious people who sought disestablishment for (as they saw it) biblical reasons.” (8) There is no doubt that Leland, as well as other dissenters, sought to disestablish religion in part based on their deep faith and desire to protect their religion, but he was just as passionately motivated by his devotion to individual rights, as is clear from the inscription on his tombstone, written by himself: “Here lies the body of Rev. JOHN LELAND, of Cheshire, who labored 67 years to promote piety and vindicate the civil and religious rights of all men.” (9) While an honest and straight forward assessment of his life, it is humble in light of his herculean efforts in pursuit of these goals. This is also the most convincing proof that Leland’s passion for rights was not mere window dressing, although his dedication to rights also comes through in his writings. There was one argument, however, that distinguished Leland from Jefferson and Madison. Leland believed that all establishments (he used this term broadly to include religious assessments, laws imposing religious doctrines, practices, or morality) were un-Christian. While Madison used this argument in his Memorial & Remonstrance, it was a standard argument for Leland found in all his writings on the subject. (10) Leland frequently demanded that his opponents explain “where Jesus Christ, the author of his religion, or the apostles, who were divinely inspired, ever gave orders to, or intimated, that the civil powers on earth, ought to force people to observe the rules and doctrine of the gospel. Mahomet called in the use of the law and sword, to convert people to his religion; but Jesus did not-does not.” (11) Rather than inclining him to call for some type of relationship between church and state, Leland’s religious faith led him to demand the separation of religion and state. In fact Leland’s views on religious faith, Christianity, and republican principles were intertwined and pointed to the same conclusion. From his core belief that religion must be freely chosen, since one’s salvation rests on sincerely held beliefs, it followed that individuals should be free from government interference in matters of religion. This meshed well with his conviction that republican governments were formed by individuals through social contracts for mutual benefit, and like Locke, Leland believed that some rights could not be given up in this social contract. For Leland, liberty of conscience was one of those inalienable rights. To this point, Leland’s conception of religious liberty follows the reasoning of almost all eighteenth-century Americans, but whereas others believed that the inalienable right of liberty of conscience was compatible with religious assessments and other laws supporting religion, Leland insisted that any mixing of religion and government violated individuals’ liberty of conscience. If individuals were to freely choose religion they must be free from temptations or punishments from the state, then “it must be impious usurpation for ecclesiastics or civilians to legislate about religion.” (12) This view of the relationship between religion and government is also tied to another right that Leland saw as necessarily flowing from the conception of the rights of conscience and also from his republican principles: equality. Individual equality is also the distinguishing feature of religious liberty, in contrast to mere tolerance. Leland grasped this when he declared, “The liberty I contend for is more than toleration. 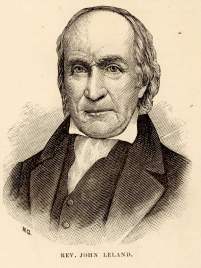 The very idea of toleration is despicable; it supposes that some have a pre-eminence above the rest to grant indulgence, whereas all should be equally free, Jews, Turks, Pagans and Christians.” (italics mine) Thus he chastised those who called only for “an equality of all Christian societies.” Leland was very clear that “the liberty [he] contended for, should be guaranteed to each individual, as his inalienable right, which cannot be meddled with, without usurpation in the rulers, which turns them to tyrants.” (14) This conception of religious liberty is inconsistent with any kind of law on the subject of religion which privileges the beliefs or practices of a particular religion or denomination. Leland therefore consistently opposed all laws on the subject of religion except those protecting religious freedom. The third defining feature of dissenting church-state relations, according to accommodationists, is that they desired only to limit the government from intervening in church affairs, but not the other way around. As described by Esbeck, these evangelical dissenters were seeking “a separation where moral values based on religion were welcomed in the marketplace of ideas and in the formation of public policy and law.” (15) And that Leland was fully in support of this position and “had no qualms about a robust involvement of the church or her members in political activity.” On the face of it, it is true that Leland did not object to the participation of clergy or their flocks in politics, but what Esbeck fails to mention is that Leland supported only their participation in matters related to civil concerns. He was adamantly opposed to their political participation for the purpose of trying to get any religious dogma or practices, including “moral values based on religion,” into “public policy and law.” Leland was engaged in politics to fight for civil and religious rights. As Leland claimed he “never labored hard to support the CREED of any religious society; but have felt greatly interested that all of them should have their RIGHTS secured to them beyond the reach of tyrants.” (16) To advocate for a political participation for the purposes of having one’s own religious beliefs enforced by law would have been anathema to Leland, and entirely contrary to everything he did or said. Leland used persuasion in politics to advocate for the kind of government that he believed was consistent with religious liberty. But when it came to religious matters, Leland believed that persuasion was the only option. If one believes that it was commanded by God to observe the Sabbath and therefore thinks that everyone should observe it, then, according to Leland, they could try to persuade others to follow this practice, but what they could not do (or should not be able to do) is to engage in politics for the purpose of having it imposed by law. He insisted, “religious laws and test oaths should never be woven into constitutions, or mixed with the laws of state,” because “[i]t makes a constitution, or statute law book, look more like a catechism than a rule of political life.” He spent his entire life calling out “[t]he evil of blending religion and property – religion and education – religion and commissions – religion and politics together.” (19) (italics mine) The legitimate purposes of political engagement were for civil not religious reasons, including “moral values based on religion.” And it is here, on the topic of religious morality, that the accommodations usually rest their arguments for an accommodationist interpretation of the dissenting population. Leland wrote extensively on this subject, and consistently objected to all laws imposing religious morality. In objecting to the existence of laws imposing morality Leland maintained that the root of the problem lay in confusing “sins and crimes together—making no difference between moral evil and state rebellion.” It is not a crime, Leland averred, to “worship one God, three Gods, twenty Gods, or no God” because it does no injury to “the life, liberty or property of another.” The state could only “punish the man who works ill to his neighbor.” (20) Staying true to his principles of individual rights and his understanding of Christianity, Leland actively engaged in opposition to laws enforcing religious morality, including the enforcement of the Sabbath. Leland simply cannot be made into an accommodationist. He was in favor of the same strict separation of religion and government as his rationalist allies. To Leland, a strict separation of church and state protects religion, the state, and individual rights. Unlike the limited religious liberty advocated by accommodationists, Leland’s religious liberty was individualistic, broad, and egalitarian. At a time when the Religious Right characterizes the battle over the meaning of the First Amendment as one between the nonreligious and the religious it may be hard for some to accept the idea that someone as pious as Leland could advocate for the same type of political vision as the rationalists. But it should not be surprising that those in the minority, whether they be deists or Baptists, would share a similar vision of religious liberty that would free them from the religious dogmas and opinions of the majority (or the most politically powerful). Leland’s story also challenges the claim that separation is hostile to religion. (21) The very pious Leland believed that separation was essential to the purity and health of religion. 1. C.A. Browne, “Elder John Leland and the Mammoth Cheshire Cheese,” Agricultural History, 18 (Oct., 1944), 147 and 150-151. 3. Leland, “Van Tromp Lowering His Peak with a Broadside,” 1806, in “Dissent and Disestablishment: The Church-State Settlement in the Early American Republic,” by Carl H. Esbeck (Brigham Young University Law Review, 2004), 1508. 4. The fruits of their labors can be seen these Supreme Court case, as well as others: in Good New Club v. Milford the Supreme Court ruled that schools could not deny religious groups the use of its facilities if it allowed other groups to do so; in Greece v. Galloway the Court ruled that sectarian prayer was permissible as long as there is no policy of discrimination; and most infamously in Hobby Lobby v. Burwell, where the Court ruled that a for-profit corporation could refuse to provide certain types of birth control for its employees because of the owners’ sincerely held religious beliefs. 6. At the Virginia Baptist General Committee Meeting (August 5, 1786) Leland was appointed to represent the Baptists at the legislature. [Charles F. James, Documentary History of the Struggle for Religious Liberty in Virginia (J.P. Bell Company, 1900), 143] In 1794, Leland returned to Connecticut and on the steps of the Assembly he gave an impassioned speech against establishments. Then in 1802 Leland’s strongly separationist The Rights of Conscience was included in a packet sent to the Connecticut legislature to protest against the town-by-town establishment. In 1803 he was sent to the Connecticut legislature “representing forty-two Baptist clergymen, twenty licensed exhorters, four thousand communicants, and twenty thousand attendants” to plead against the establishment of religion. [M. Loise Greene, The Development of Religious Liberty in Connecticut, New York: Da Capo Press, 1905, 387] The same was true in Massachusetts, where he was sent by the Baptists to represent them at the 1811 legislature. 9. Browne, “Elder John Leland,” 153. 12. Ibid., 476 and 487. 14. Ibid., 118 and 562. 15. Esbeck, “Dissent and Disestablishment,” 1579-80 and 1522. 17. Esbeck, “Dissent and Disestablishment,” 1523. 18. Leland, Writings, 487-8 and 223-4. 19. Ibid., 251 and 294.